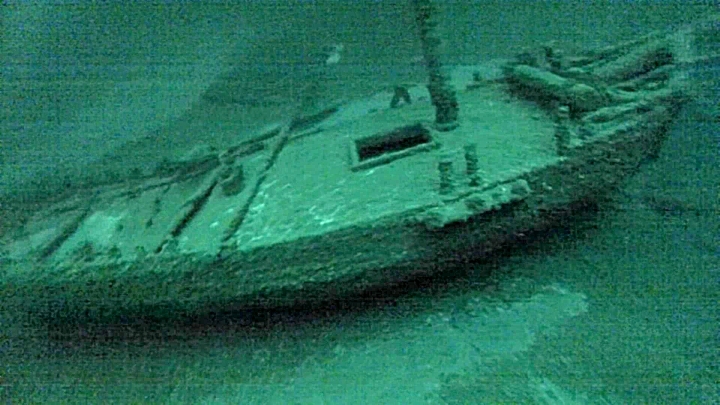 ALBANY, N.Y. — The second-oldest confirmed shipwreck in the Great Lakes, an American-built, Canadian-owned sloop that sank in Lake Ontario more than 200 years ago, has been found, a team of underwater explorers said Wednesday. The three-member western New York-based team said it discovered the shipwreck this summer in deep water off Oswego, in central New York. Images captured by a remotely operated vehicle confirmed it is the Washington, which sank during a storm in 1803, team member Jim Kennard said. "This one is very special. We don't get too many like this," said Kennard, who along with Roger Pawlowski and Roland "Chip" Stevens has found numerous wrecks in Lake Ontario and other waterways. The sloop Washington was built on Lake Erie in Pennsylvania in 1798 and was used to transport people and goods between western New York, Pennsylvania and Ontario. It was placed on skids and hauled by oxen teams across the Niagara Isthmus to Lake Ontario in 1802 after being sold to Canadian merchants. The 53-foot-long ship was carrying at least five people and a cargo of merchandise, including goods from India, when it set sail from Kingston, Ontario, for its homeport of Niagara, Ontario, on Nov. 6, 1803. The vessel was caught in a fierce storm and sank. At least three crew members and two merchants were on the sloop. All aboard died. According to Kennard, contemporary records said portions of the cargo and pieces of the ship were found the following day on a shore near Oswego. The Washington is the oldest commercial sailing vessel found in the Great Lakes and the only sloop known to have sailed on lakes Erie and Ontario, Kennard said. Single-masted sloops were replaced in the early 19th century by two- and three-masted schooners, which were much easier to sail, according to Carrie Sowden, archaeological director at the National Museum of the Great Lakes in Toledo, Ohio, which sponsors the New York team's explorations. Since there are no known drawings of the Washington, the sloop's discovery will help maritime historians learn more about the design and construction of that type of sailing vessel used on the Great Lakes between the American Revolution and the War of 1812, she said. "Every shipwreck offers something different that adds to our knowledge base," Sowden said. The oldest vessel found in the Great Lakes is HMS Ontario, a British warship that sank in Lake Ontario in 1780. Kennard and another explorer found that wreck in 2008.